This is a part of bishop chess piece. This part called head part that become the most important part of a chess piece. It because, by this part we can distinguish the chess piece. Basically, to distinguish the types of chess pieces, we only see the shape of his head. From the shape of his head, we can know the names of each chess pieces. By this bishop head, we can conclude that this chess piece is in giant size. It must sized more than 12 inch. 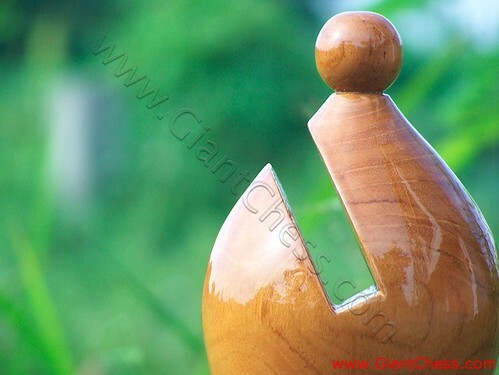 Made from best quality Teak wood and carved beautiful by expert craftsman, make this chess proud to become one of your house decoration or your collection for outdoor game. Something giant must suit for outdoor use. And here, we present you a giant chess piece that has polished in glossy brown. Get also in another color and another sizes.